I started this off as a Facebook Post in response to all the comments on the Craighall Park Facebook page but I find that often these posts are ephemeral and get lost in the ‘noise’ of social media. By writing a blog anybody can forward to other residents to be alert to the situation. I would like to think this is more a matter of ‘educating’ and ‘raising awareness’ about the code of ethics around the community library, rather than treating it as a criminal act of outright theft for personal gain. As I indicate in the title, leisure-reading in the context of dire poverty is a luxury beyond imagining for those living below the bread-line. As many of you know we started a community library on the pavement outside Liz at Lancaster in late 2017 for people to take-a-book/return-a-book. 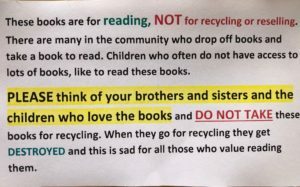 It has worked wonderfully until Wednesday 28th March when one of the informal recyclers came past and after a short period of contemplating the box, emptied virtually the entire full box of books into his recycling trolley. I am not precious about books being in pristine condition as a well-thumbed book is a treasure, carrying visual and tactile traces of its readers and its history. But, I weep at the thought of wonderful books simply going to recycling, if this was the case. Most of the books in the book-box were worthwhile reads and many of the children’s and teenager books were brand new. 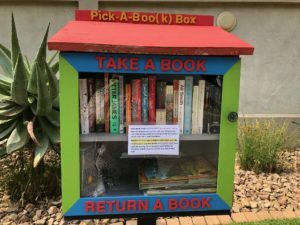 A couple of Craighall Park residents have said that on occasions they’ve seen groups of kids sitting on the pavement reading the books from the little library. This makes it all worthwhile. I have already restocked the box. A community member dropped a whole lot of kids’ books off some time ago and I’d kept them ‘in stock’ plus I raided my in-house guest library as well as my own shelves. I will wait a while before restocking with the brand new kids and teenager books I have ‘in stock’. Also several residents have offered to donate more books. So more stock is not really the issue. 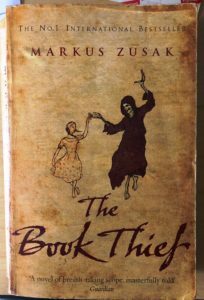 And I guess it’s not really appropriate to put in the wonderful book by Marcus Zusack? ! I have put a sign on the box although many of the recyclers are from neighouring countries and might well be functionally illiterate and also not very proficient in English. Going forward I might need to put signs up in other languages but as per comment below I think face- to-face is much more effective. Stay at our well located Guest House and see our Little Red Library. View our Craighall Guest House for Rates and Availability! And perhaps if any of you see recyclers around the book-box, you can chat in a non-threatening and constructive way about the library and how it can work for all in the neighbourhood. Of course the assumption here is that a recycler can speak English or that you can speak Sotho/Zulu/Tswana/etc. Maybe also chat to helpers and local workers like builders to also spread the word and be part of an ‘awareness’ of the ‘codes of conduct’ around the lending library. It’s highly problematic for people who have got nothing and live hand-to-mouth to be even more marginalized and alienated. Those guys are not baddies – they are human beings trying to make an honest living. 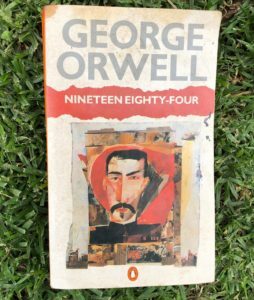 So what about next Monday someone stands by the library and explains it to them – what the books are for, that it is to help people – maybe someone who can speak a few languages. And maybe then they will leave it alone. Maybe not, but first stop should be to appeal to people human-to-human. « Firsts, lasts and everything in between. Plan your calendar!